Thoughts on Wisconsin, Michigan injuries and the Ohio State game. For a brief minute, Michigan was in control of this game. Up 10-7 in the 3Q, Michigan's defense had completely figured out Wisconsin. The momentum was clearly on the Michigan side of the field. Peters was being asked to make a lot of passes, to carry the offense as the running game was stiffled by a good Wisconsin defense and because of injuries to Higdon and Isaac. But Peters was doing well. He was stepping up in a big game. His touchdown drive in the 2Q was masterful, maybe the best drive of the year. Michigan had Wisconsin stopped on a 3rd down, but a highly questionable pass interference call kept the Badger drive alive, en route to the go-ahead score. Alex Hornibrook went from goat to G.O.A.T. in minutes as Wisconsin suddenly found new life. We had ourselves a ball game. On the ensuing drive, Wisconsin's Andrew Van Ginkel came free on a delayed stunt up the middle and delivered the monster hit to Peters and drove him into the ground on what many felt was a unnecessary roughness penalty, which was not called. As Van Ginkel stood up, he immediately motioned to the Michigan bench that Peters was in need of immediate attention. Laying motionless on the ground, Peters was out cold. You could see the seriousness in Van Ginkle's reaction. It was a brutal hit, but it was a football hit that I'm sure any Michigan defensive player would make if given the chance. It should've been flagged though. That's when this game went to a bad place. 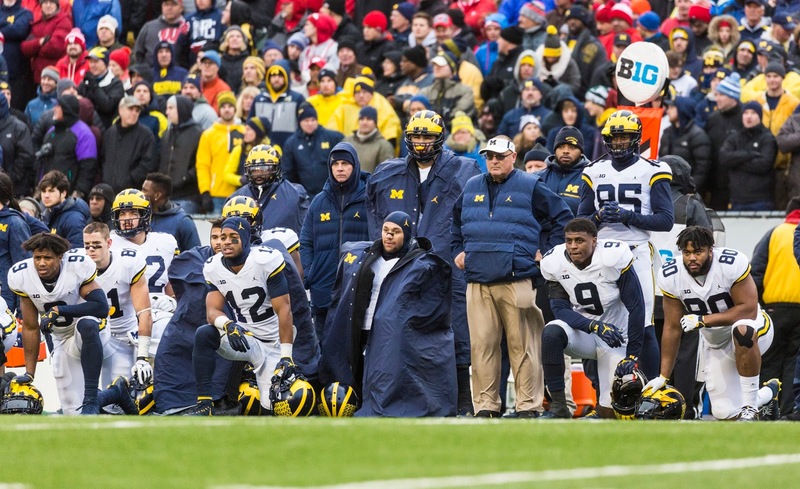 The Michigan players were kneeled on the sideline, the stadium was silent. Just as when Peters entered the Rutgers game and instantly rejuvenated a lifeless team and Michigan crowd, the opposite could be said when he went down yesterday. This team, most teams, are not prepared to handle a blow like this. With Michigan reeling, Wisconsin pulled away. The rest of the game had a very pre-Peters feel to it. With nothing left but just the general chaos-ness of an O'Korn-led offense, Michigan had no answer this day. With Ohio State next on the schedule, Michigan would love to have Peters and or Speight healthy enough to go against the Buckeyes, but of course no promises. In a season when both of Michigan's best options at QB have been taken by ambulance to hospitals for injures, it's probably too much to ask at this point. I wish I had the magic words. I wish I knew what to say to make sense of all of this. On paper, Michigan is a young, inexperienced team that has been decimated by injuries on the offense. Two quarterbacks, two running backs, a starting left tackle, starting receiver...all out with substantial injuries. And when going up against superior teams, these deficiencies show their ugly head in obvious ways. Michigan just isn't there yet. And that's okay. That's fine. Because that's college football for you, and the law of things says that as this team grows and matures things will change, they will get better. They're not going to beat Ohio State this week, but they are going to get better. But when framed by the previous 10 years of struggles, especially against good teams in meaningful games, the grind Michigan is facing this season seems far more desperate and unnerving to witness. Losses to Michigan State, Penn State, Wisconsin and yes, Ohio State, are the price you pay for being young, inexperienced and injured all at the same time. The senseless "This is Harbaugh's 3rd year" argument is a feeble narrative used to quickly and passively cast Michigan under Harbaugh as a failure. It's a lazy fans way of just throwing up their hands and saying "I want things to go my way". There's no script for this. There's no guarantees either. Many fans immediately started chanting "Michigan is back" the minute Harbaugh was hired without taking the time to see there were serious deficiencies on this roster. You don't go from Rich Rod to Hoke to champions of the Big Ten...THIS Big Ten...overnight. I don't care who the coach is. It's a process. Trust the process. Or don't. 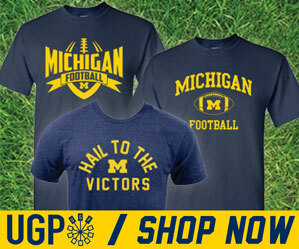 Either way, I'm buying up all of the Harbaugh stock I can right now.